Escape for the weekend or just for the day! In the center of the Pacific is Hawai‘i. In the center of Hawai‘i is Lana‘i. Lana‘i, with 141 square miles, is the sixth largest of the Hawaiian Islands. It is also the most recent to experience the change from agriculture to tourism. At one time, Lana‘i was the world’s largest pineapple plantation with over 16,000 acres under cultivation. Lana‘i still grows some of the sweetest pineapple in the world but only for local consumption. With two of the world’s finest hotels, Lana‘i is quickly becoming one of the premier resort destinations in the Pacific. Lana‘i’s climate adds to its uniqueness. From the cool and misty uplands of Lana‘i City, where most of Lana‘i’s residents live, to the sunny warm beaches that ring the 47 miles of coastline, Lana‘i’s climate seems to change continually. But one thing doesn’t change on Lana‘i; the warmth and friendliness of the people who call Lana‘i home! They still greet each other and visitors alike with a friendly wave and a smile whenever they meet. So, welcome to this very special place. Enjoy your stay, enjoy this island, enjoy the many activities, but most importantly, enjoy the island’s greatest treasure—its People! One day on Lana’i is enough to scratch the itch for exploration—but not enough to fully scour the island from coast to coast. 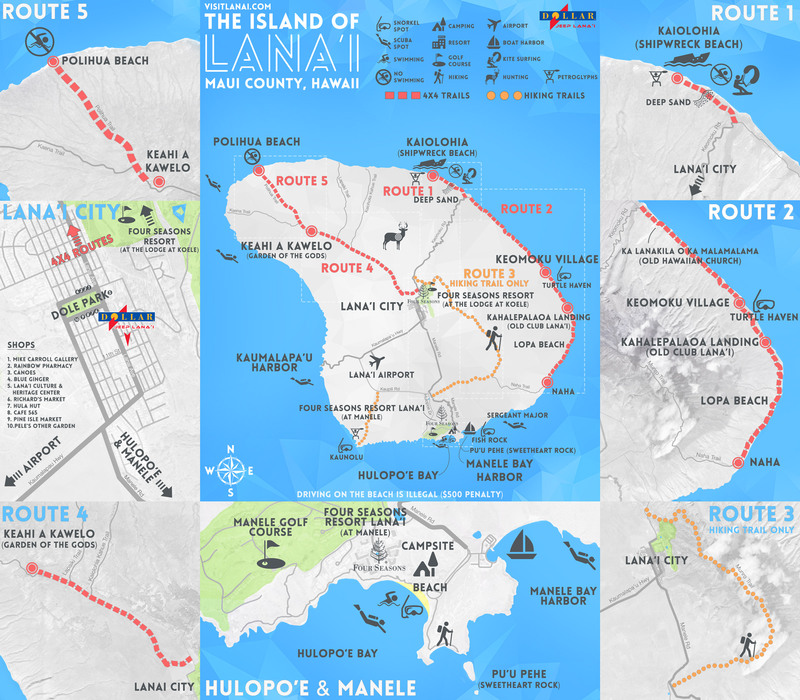 Many travelers who are visiting Lana’i as part of a day trip from Maui, will arrive on the island with the early ferry that leaves from the town of Lahaina. By taking the early ferry at 6:45am, you’ll be in your Jeep and off on an adventure by approximately 8:30am, which leaves 7-8 hours for exploring Lana’i before the ferry ride home. With a single day to spend on Lana’i, pick up snacks and drinks for the road before departing Lana’i City, and head eastwards over the spine of the mountain towards Kaiolohia Beach. On the switchbacking, winding drive towards the coast, take the time to occasionally pull over and take in the panoramic views, which stretch all the way from Haleakala volcano to Molokai’s southern coast. When you reach the end of Kaiolohia Trail, enjoy the short, rock-hopping walk to the sands of “Shipwreck Beach,” where you can scour the wind-whipped coastline for shells, or hike to the petroglyphs hidden in a gulch just a few hundred yards from the coast. Back in the car, continue the adventure by driving south to abandoned Keomoku Village, where the hauntingly beautiful Ka Lanakila Church sits right by the side of the road. Behind the church, walk the short trail through the grove of kiawe to the remains of the Maunalei sugar mill—a failed venture that lasted a year and closed in 1901. Continue driving towards Kahalepalaoa and the remnants of Club Lana’i, and enjoy a picnic lunch on the beach if the tradewinds have yet to pick up. The adventurous can head further to Lopa Beach, just a couple of miles south, where a sandy cove tucked out of the wind has gently rolling waves, and is a favorite of locals for surfing, kayaking, and fishing along the coast. On the second day, begin with breakfast in Lana’i City before driving towards Munro Trail, where you’ll park at the end of Cemetery Road and embark on a morning hike. In the first two miles of the forested trail there are sweeping views of the coastline, and by taking the spur trail towards Koloiki Ridge, you’re afforded with views of Maunalei Gulch and the distant West Maui shoreline. Hike for as long as you’d like on the trail, eventually returning back to the Jeep for a trip towards the northern coast. Before you embark on the drive to Polihua, make a stop in Lana’i City to pick up some water and lunch, before making the drive towards Keahi A Kawelo, also known as “Garden of the Gods.” As enticing as it is to stop and take photos, it’s best to simply keep driving, as this red-Earth landscape will come to life a little later in the day. Instead, continue down to Polihua Beach on a bumpy, eroded trail, where just when you find yourself thinking the beach should appear at any moment, you see a patch of a bright white sand and a foot trail leading towards the beach. Windswept, remote—and dangerous for swimming—Polihua is a scenic spot you’ll often have all to yourself. Once you’ve tattooed the sand with your footprints, make the dusty climb up the hill back towards Keahiakawelo, where in the softer hue of the afternoon light, the rocks will cast a reddish glow that’s matched by the rich red Earth. In this Martian landscape of dirt and stone, it appears that boulders and rounded rocks have literally rained down from the sky—frozen in time, stuck in place, and surrounded by nothing but silence. On the third day, visit any of the places above where you didn’t get to spend enough time, or enjoy the sights around Lana’i that aren’t down a red dirt road. At the Lana’i Culture and Heritage Center, explore the island’s fascinating past and a trove of ancient artifacts, or try a new restaurant in Lana’i City for either breakfast or lunch. Make the drive to Hulopo‘e Bay for snorkeling, swimming, or Snuba, perhaps stopping at the Luahiwa petroglyphs on the pine-lined drive down the mountain. To take a break from splashing in the waves, enjoy the hike to the Pu’u Pehe Overlook on the southern end of the bay, where a rocky trail leads up the cliff and looks towards “Sweetheart Rock.” From this famously scenic vantage point above the turbid surf, you can make out a heiau, or ancient temple, perched carefully atop the rock, and also see the stretch of fine white sand at the small, hidden “Shark’s Bay.” On the other side of Hulopo‘e Bay, in front of the Four Seasons resort, the Kapiha‘a Fisherman’s trail goes slinking around the coast, and passes by relics and rock formations where an ancient village once thrived. Keep an eye out for spinner dolphins as they splash and leap in the bay, and in winter you can often see Humpback whales as they spout and breach off the coast. On the winding drive back up to Lana’i City, reflect on the beauty and natural scenery you’ve experienced in only three days, on an island where pine trees, sea caves, and shipwrecks are part of the tropical adventure. If you want to enhance your island experience by hiring a local guide, the guided Jeep safari is a 4-hour tour that’s paired with a picnic lunch. To take the adventure underwater, inquire about the 6-hour tour that also involves snorkeling and beach time, for a full day experience of exploring Lana’i from the ridgelines down to the reef.